Fed minutes showed officials divided over whether to increase rates in September. China devalued Yuan – China may not maintain 7% GDP growth – Investors low on confidence. Brazil market plunged to its 10yr low on the concerns of ongoing political crisis. Tensions between North and South Korea led investors to take money out of South Korea. The Korean stock market touched fresh 5-year low. Greece PM Alexis Tsipras resigned and called for an early election. Chicago Board Options Exchange volatility index was up 46%. Tensions between North and South Korea led investors to take money out of South Korea – equity markets at a 5 year low. Signs of investors fleeing to safety as bond markets witnessed a rally besides all safe haven instruments like Gold, Swiss Franc and Japanese Yen trading on the positive side. Analysis of data assimilated from over 1.5 million social media posts, of which over 90% are tweets, affirm that stock market sentiment is now at the lowest point. The sentiment heatmaps, created on the basis of data from social media posts, have gone from bad to worse over the past one week. 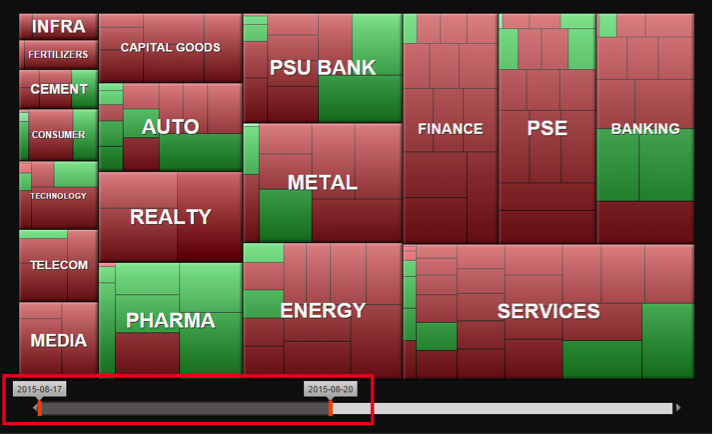 Heatmaps suggest that markets could remain subdued over the next few days. All sectors except Pharma and Consumer will see selling whereas the latter two may see select buying according to trends suggested by the Heatmap. Since last monday August 17th,2015 there has been a 250% jump in ‘mentions’ (posts) about India’s stock market, 280% increase in posts about Asian crisis . 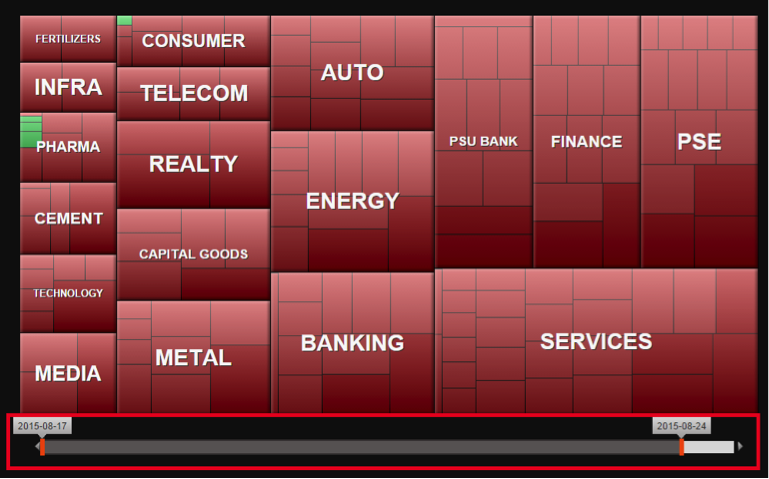 A 116% surge in posts about Asian financial market and 100% increase in mentions about commodity prices. Such spikes alongwith the negative sentiment alerted Heckyl users of an imminent downtrend and a possible crisis. It is yet to be seen how long this frenzy continues but we can detect quick turnaround in stocks by analysing its sentiment , from the impact of social media tweets and posts. 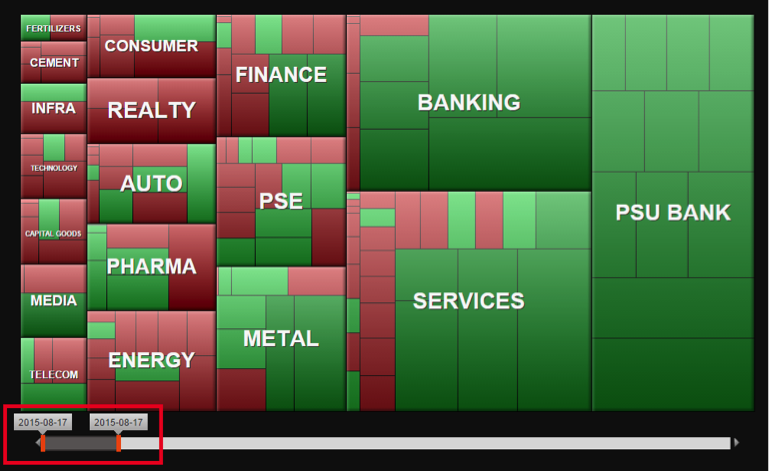 Additionally when viewed in tandem with the price for a particular stock, you can also find insight on news around stocks within your portfolio by simply observing the sentiment graph, that should move hand in hand along with the price. Through our earlier blog posts we have explained how a streaming analysis of tweets offers us updates that can help us feel the market pulse in real-time. To understand how the sentiment around news from social media tweets, posts and other news sources can help a trader or investor stay ahead in the financial markets , head to our blog post Sentiment Analysis in Finance or you could write to us at info@heckyl.com.